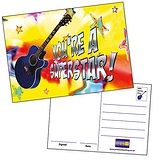 These brilliant 'You're a Superstar' guitar-themed postcards make perfect rewards for your pupils. 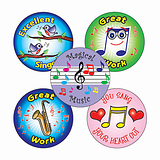 Printed on quality card, each one is A6 size (approx. 150mm x 105mm). There is space on the reverse for you to add a message, address and affix a stamp.